Note: the Azure Security Center content pack has been retired. Please visit our documentation to learn more about content packs currently supported. Azure Security Center offers increased visibility and insights into your Azure resources and Azure workload security. 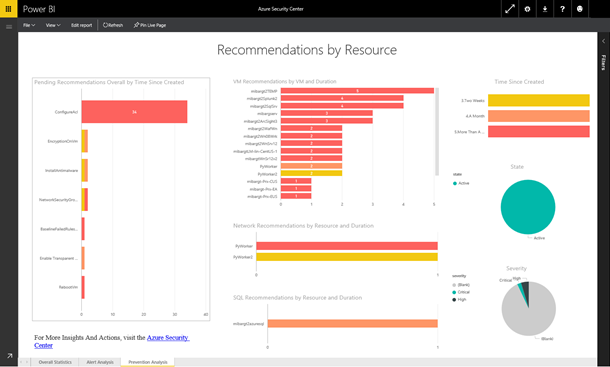 The Power BI content pack enables you to visualize, analyze, and filter recommendations and security alerts. The out-of-the-box dashboard and reports are created on top of your Azure Security data, enabling you to see and analyze it. 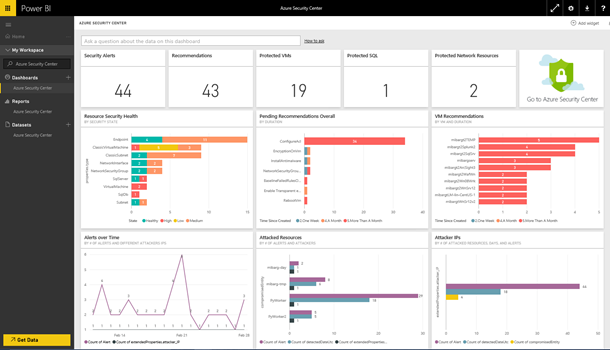 This post will explain how the Power BI content pack can help you explore and monitor your Azure Security Center data. For additional details on how to get started, please see the Azure Security Center content pack for Power BI help page. To connect to the content pack, you will have to provide your subscription ID and Azure Security account credentials. Once your data has been loaded, a dashboard, report, and dataset is automatically created with your Azure Security data. The out-of-the-box dashboard offers a set of prearranged insights, and you can select any of the tiles to drill down into three pages of associated reports. For example, selecting the Pending Recommendations tile opens the Prevention Analysis report, which displays recommendations by resource. These pages give a better understanding of your security status and risks, such as how much time each task waits before being resolved. Navigate through the report pages using the named tabs at the bottom. On each page you can select or hover over the visualizations to see additional details. From any of the reports you can pin the visualizations or tiles to the dashboard by hovering over them and selecting the pin icon. Pinning the visuals will prompt you to select a dashboard to pin to, allowing you to customize and combine data from multiple sources. You can also choose to edit the report by changing or adding additional visuals. On the right-hand side of the screen you’ll see a list of all the tables and fields you have access to in the content pack, ready to be added to new visualizations and measures. After the initial import, the dashboard and the reports will continue to update daily, and you can control the refresh schedule on the dataset. 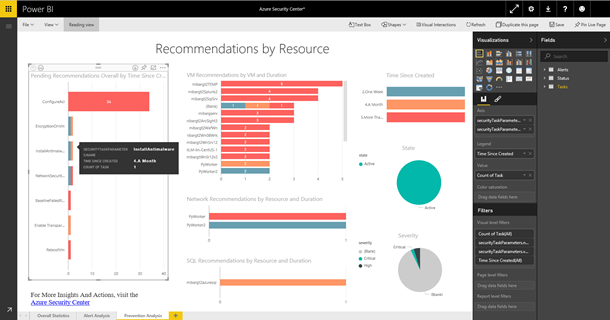 With the Azure Security Center content pack for Power BI, you'll get an initial set of detailed insights that you can use to explore your security data even further. We’re always interested in hearing your feedback! Contact us at http://support.powerbi.com to let the team know about your experience and if there’s anything we can do better.